Many people have asked me why I chose the destinations for this trip. My answer has generally been something along the lines of, "I want to go to places off the beaten track, where (mostly American) people don't visit very often." This was quite true of much of Central Asia, and even so for China and Mongolia, although to a lesser extent. 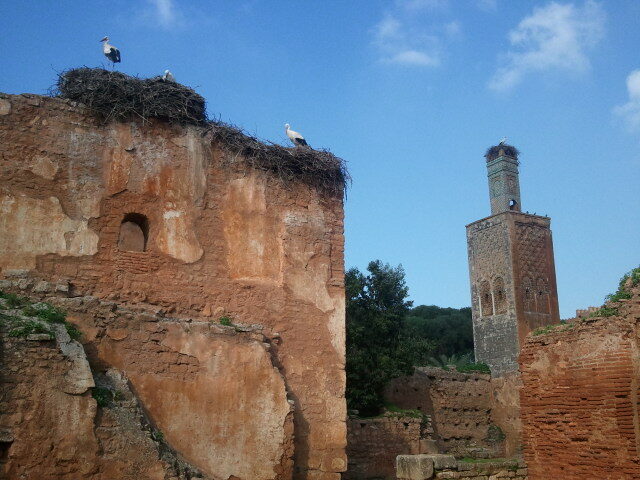 Morocco, however, is a different story. First off, Morocco has been a tourist destination for at least a hundred years, I figure, with the French colonization and proximity to Europe. In Central Asia, people are still getting the hang of this "tourist exploitation" thing, but in Morocco they have it down pat. At every turn, in even the small towns, people are constantly trying to sell you knick-knacks, tours, or useless services (like pointing you in the direction of the tourist plaza you just ran away from). I (Anna) arrived at the airport with no less than 60 lbs of gear - 20 or so of it was actually mine. It wasn't a total burden though, I got to walk through the Paris airport carrying a motorcycle helmet and a techy-looking duffel bag. People either looked very confused or very impressed - either way it made me feel cool. The pilot on my flight from Paris to Casa even informed me, politely, that all I would need for the flight was a seatbelt - the helmet wasn't necessary, before exploding in laughter. The only thing that kept me from exiting customs in Casablanca wearing the helmet (to help Shawn find me, of course) was the larger urge to finish my 24 hours of traveling and give that man a hug (helmets get in the way of that). I was insanely jealous that Shawn was already multiple days of eating delicious food ahead of me, so we immediately went out and "splurged" on a $15 dinner. Then, we actually splurged by renting a car (thanks Kevin and Arlene!) so we could escape the time-sucking nature of bus travel or hitching, but still have the freedom of stopping where we wanted. The picture below is of us right before we crossed the Tizi n' Test pass that crosses the High Atlas Mountains. It is a "yellow road" on our map, which apparently means that ALMOST two cars can fit on the road and there are lots of holes. Everywhere. Needless to say, travel is slow. And stressful, Shawn might say, when you have a passenger screaming every time you round a corner and have to slam on the brakes for the truck coming up the hill. We stopped in Taliouine,a little countryside town known for growing saffron (so I bought some) where I discovered that I do not, in fact, hate olives (so I bought some a lot, on several occasions). We began our week long road trip by going to the market, where there were oranges, onions, beans, cauliflower, etc. etc. (so we bought some). Shawn practiced his French (C'est combien? Q'uest-ce que c'est?") and made us dinner, while I fulfilled my role of lady on holiday by reading on my Kindle (imagine having the time to read!) and occasionally checking to see if the laundry Shawn had done was dry (it wasn't, ah well, better sit down...). 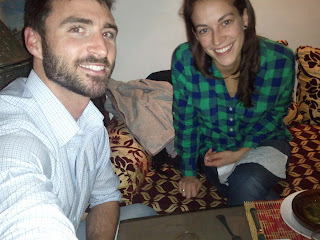 We stayed a few nights, so we could spend the day trekking around the town. The town is surrounded by these amazing rock formations (and no trees, really). 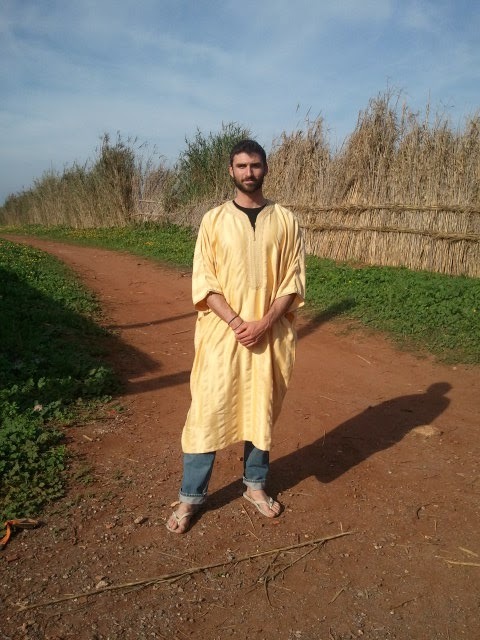 We hiked up and out of the town, through some smaller villages and back to the road, where we attempted to hitch back until our generous ride stopped and said, "Two minutes", then walked off. We walked back. Taliouine is in the background. A view of the hills surrounding Taliouine. We continued on, staying in various cheap hotels that felt like dungeons and had gross bathrooms. 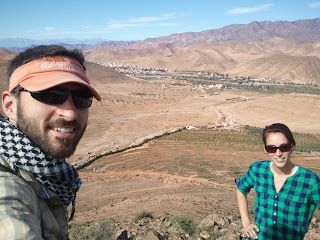 We ended up pushing pretty hard to reach a town called Merzouga, which is on the edge of the Sahara, where we stayed at the best place in Morocco, Hotel Kasbah Panorama. It's situated on a hill, which gives a beautiful view of the dunes. We were there during the lull before the holidays (New Year's), so we were treated really well by the family who owned it. Hands down, the best food we've had here, no one tried to get us to buy useless crap, and it was peaceful. One of the owners, Ismael, showed us around a bit and talked with us about Berber culture a lot - education, history, etc. This is Jovanna. She is cute. Her partner, Jovannie, followed us into the desert (brave cat!). 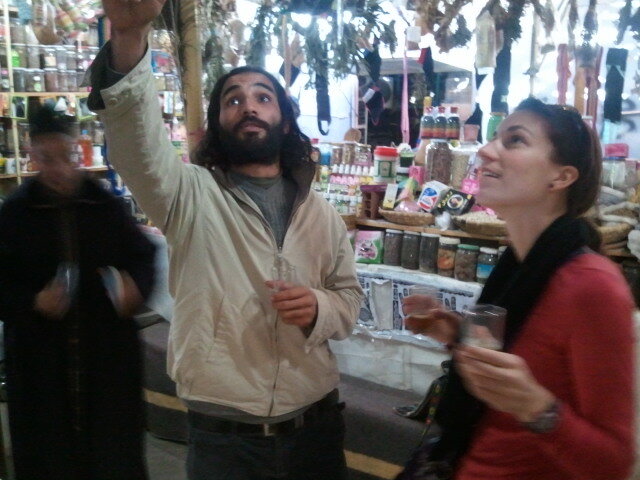 Ismael, whose family owns the hotel, took us to the souk (market) in Rissani and showed us where you can buy spices. There were so many types and they smelled so good, so I bought some a kilo of spices...oops. 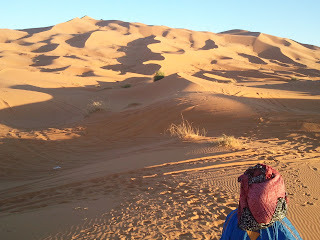 Saharan dunes, plus Youssef, our guide, who spent some of the walk talking on his cell phone. Hiking the dunes for a sunset view. Small Anna on a big Saharan dune at sunset. Shawn playing on the dunes at sunrise. So early. So cold. The nomadic Berber camp we slept in, while fennec foxes walked silently around our tents all night, taunting me (my biggest hope was to see one of these critters - no foxes, but lots of burrows and tracks). The well - only 1 meter deep and - BOOM - cold, clear, fresh water. The next morning, one of the guides approached Shawn and said, "Last night, the camels, they go....I do not know where", in a most dejected way. So there we were, on a camel trek into the Sahara, with no camels! I overheard the Portuguese couple asking him, in Spanish, "Escaparon? (they escaped?)" The guide replied..."Ehh......." In truth, I suppose it's hard for an animal to escape if you don't first tie them to something. 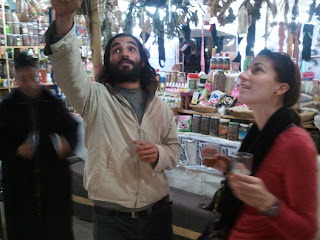 Never fear though, we're in Morocco - he maintained his dejected attitude, and offered to sell us some (fake? real?) fossils while we waited for the 4 x 4 to come rescue us. 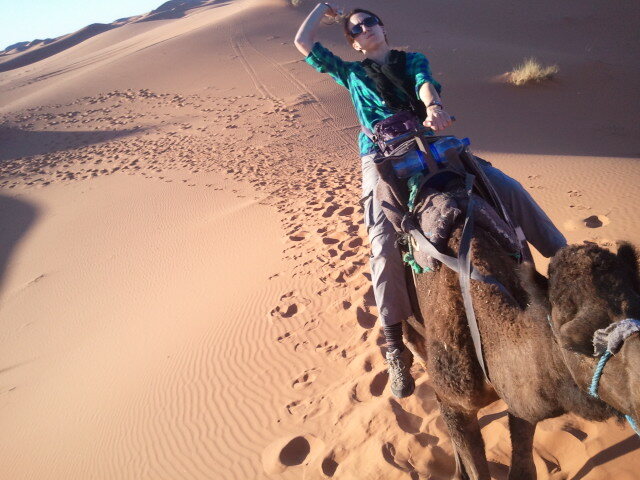 As they say, ain't no man sadder than a nomad without his camel - but $15 for a rock is still expensive. He said, "8 x 8 in, now 4 x 4 out! Haha!" We have eaten a lot of delicious little street-cart donuts, street meat-wiches, olives (Anna), and had liters and liters of mint tea, I'm sure. Now, we're kicking back and enjoying the last few days together with a newfound confidence to deal with the touts as they harrass us. We only buy things from people that barely talk to us, only enter shops where the person seems apathetic about whether we buy anything, and only stay at hotels if they don't barrage us with advertisements and attempts to draw us in. Take that, Morocco. Hands down, the best tagine we had (at Kasbah Panorama, in Merzouga) - a mixture of chopped beef and vegetables, with eggs cracked on top. It is apparently a traditional Berber dish.